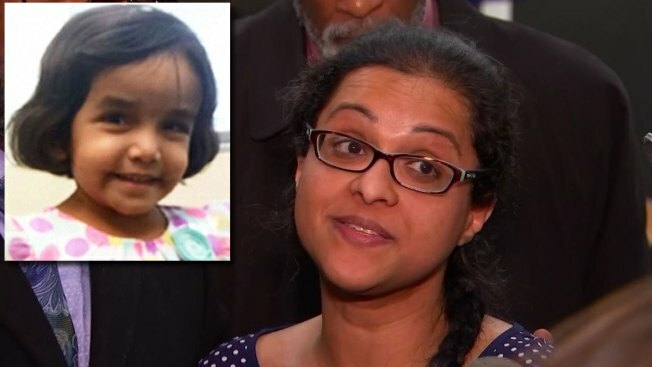 Sini Mathews, the mother of Sherin Mathews, the North Texas 3-year-old girl found dead in a culvert in October 2017, is a free woman after the child endangerment charges filed against her were dismissed Friday. Mathews was charged after prosecutors said she left her adopted daughter home alone while she and her husband Wesley went to dinner with their 4-year-old biological daughter on the night before the child was reported missing. Two weeks later Sherin's body was found in a drain pipe near the Mathews family home. The charges against Sini Mathews were dropped Friday after the district attorney said there was not enough evidence to proceed. Had she been convicted, she would have faced between two and 20 years behind bars. The charge was dismissed without prejudice, meaning it is possible the same or different charges could be leveled against her at any time. Leaving the jail Friday, Sini told NBC 5's Maria Guerrero she felt "blessed" the charges were dismissed and that she's looking forward to being reunited with her biological daughter, who has been living with family members in Houston. She said the past 15 months she spent in jail awaiting trial were "challenging." Asked if she left Sherin home alone, Sini responded "no comment." In a letter to the 282nd Criminal District Court, the Dallas County DA wrote that "after extensive investigation it has been determined that the state cannot prove this matter beyond a reasonable doubt at this time ... the state respectfully requests that this case be dismissed without prejudice." Richardson police, who investigated Sherin's death and charged Sini with child endangerment, were apparently frustrated the charge was dropped. In a statement released Friday afternoon, the department said they developed sufficient probable cause to obtain the arrest warrant against Sini and that the case was approved by the district attorney and an indictment was returned by a grand jury. Richardson police also noted that several attempts to reduce Sini's bond were also unsuccessful. "While we are disappointed with this turn of events, we will continue to work with the Dallas County District Attorney's Office to ensure justice is done," Richardson police said. Asked if she loved Sherin, Sini responded: "Yes, absolutely. No doubt." Sini's husband, Wesley Mathews, still faces a capital murder charge in connection with his daughter's death and he's being held on a $1 million bond. His trial is set for May. Harris said he does not expect Sini to testify against Wesley. "Absolutely not," he said. "This has been a tragic accident for this family and now she's just trying to get back to her other child." Sini's attorney, Heath Harris, said he next plans to fight to get his client's passport returned and to restore visitation with her biological daughter who is living with family in Houston. Eventually, Harris said, they'll work to restore Sini's parental rights. However, the spokesperson for CPS tells NBC 5 once parental rights are terminated it is permanent. It is possible Sini may be able to visit with her daughter, if the girl's adopted parents who are Sini's family allow it. Sini's attorney tells NBC 5 his client said she wanted to eat Indian food after leaving jail.